Want to play old good MechWarrior on your iPhone? We have an idea! The secret is simple – try mobile game Walking War Robots! It’s promised, your heart will beat faster once you operate this huge walking mech machine. Its detailed graphics and perfect sound system will leave no room for nostalgia and you’ll feel like in old good times. Have I mentioned it’s free? 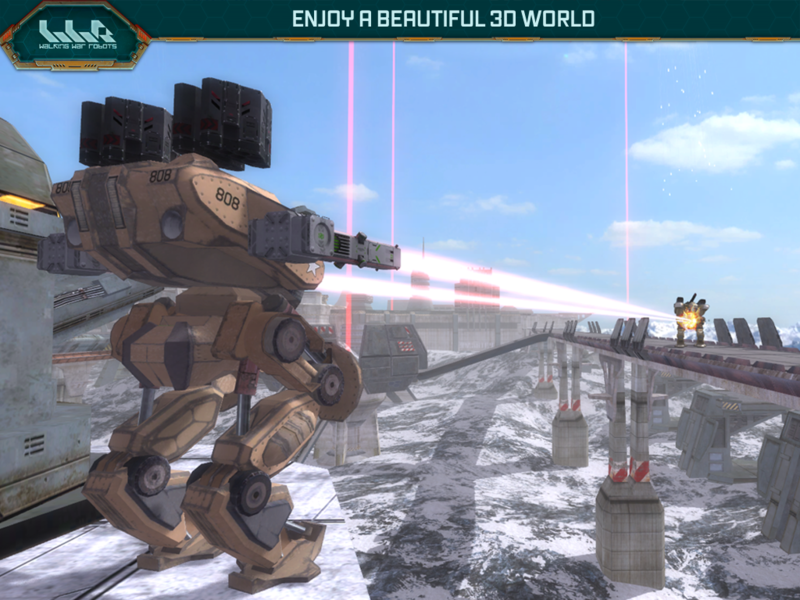 Walking War Robots is a universal game for iPhone, iPad and iPod devices and is currently translated into six languages. The game requires a strong internet connection and doesn’t have a stand-alone mode. Which is however not its downside. On the contrary playing with real people is a much more fun!. The game is available all over the world and it currently has strong clans of players in Russia, Germany, Japan, the USA, and the UK. There is sadly no in-game communication chat for now, so you’ll have to talk to the others in forum or via Facebook. The aim of the game is pretty simple. You and your team need to capture all enemy beacons and protect all yours. The first team who does it is a winner. Simple, huh? The game gives you whole freedom to apply different tactics and strategies of your choice, you can even push other robots on the battlefield! Isn’t it fun? To start the game you need to equip your robot by choosing a weapon for it. You can possess several robots, however you can play only one at a time. As you get more experience in the game, you can upgrade your robots and weapons and try the game at its all power. You can buy new weapons and robots for Gold or Silver, both are the currencies you can earn in the game if you don’t want to invest your real money. The game offers a good variety of weapons and robots. Currently there are 3 maps to play on, but developers tell there are more to come. The interface to the game is intentionally simple – most of the screen is occupied by battlefield and in the very bottom there are two management buttons basically to operate the robot with just two thumbs. In the upper part of the screen you can see the actual state of the battle as well as your robot. In case your robot is hit by a rocket and its ability to jump or shoot is broken, the corresponding button will be broke too, so pay attention to it! Drawing a conclusion, Walking War Robot is a mobile game that can keep you busy for hours and days. It is a good mix of old good MechWarrior with new modern mobile games. Try it out!